If art reflects and comments on the world around us then it’s not surprising that it also has the potential to change minds. There are lots of artists whose work engages with political issues with the aim of helping bring about social change. And while I’m on a text theme it makes sense to think about some of those who use text directly to get their message across. 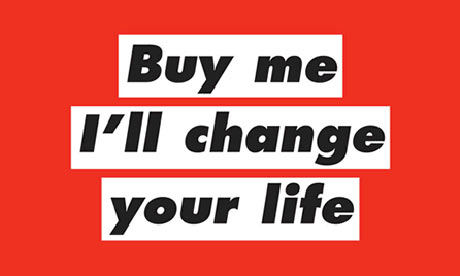 Barbara Kruger’s work draws on her own background in design and particularly in the magazine business. 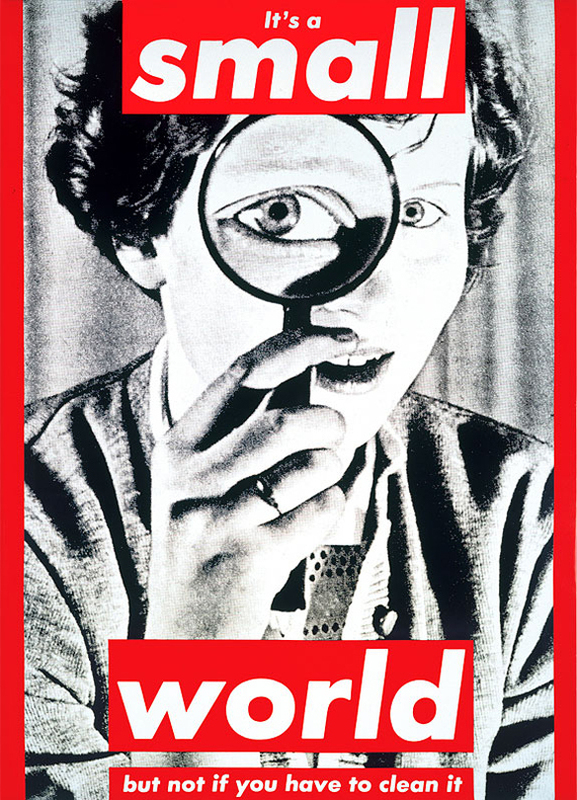 In her work, Kruger combines black and white photographs – often from magazines that promote the lifestyle she critiques – combined with text on a red ground. It’s a simple formula but it’s also a powerful one. Much of Kruger’s work is focused on gender politics with consumerism also firmly in her sights. 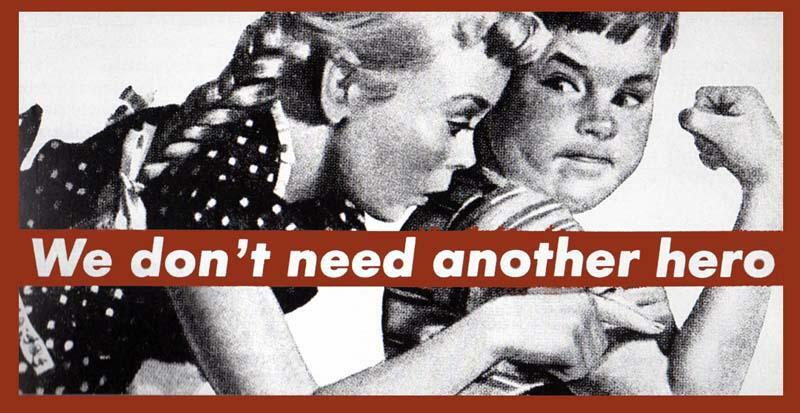 The women’s magazine industry, which Kruger worked in before becoming an artist, clearly promotes a consumerist agenda – inevitably, given its reliance on advertising – and generally prefers to pretend feminism never happened. Though such magazines often claim to empower – a horrible word, but it seems to be the right one here – women they do so only within the confines of the status quo. Kruger’s agenda is unequivocal. Though she often uses humour to get her message across she doesn’t shy away from a deadly serious approach when it’s warranted, particularly when the issue in question is the so-called pro-life agenda. 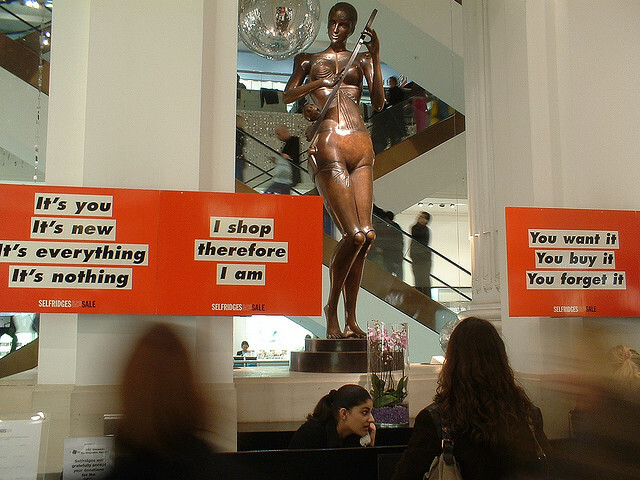 In commenting on consumerism Kruger’s work becomes interesting in a different way. 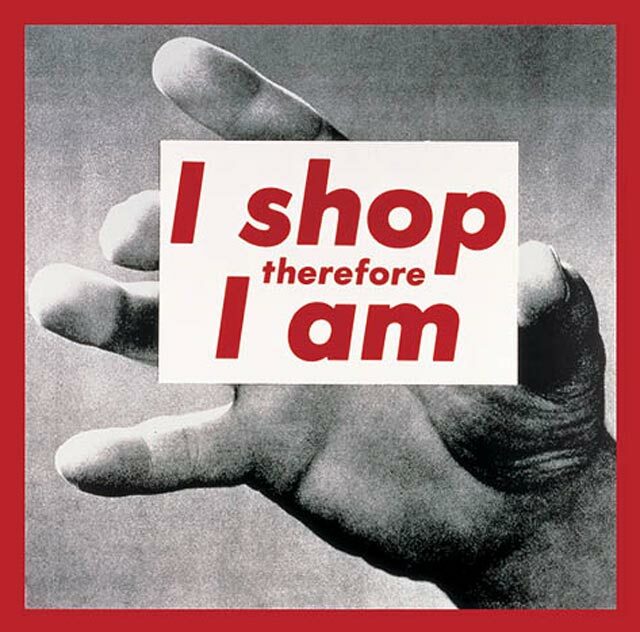 The message ‘I shop therefore I am’ suggests that shopping will never offer the fulfilment that the magazines suggest it might. And yet Kruger’s work, taking a slightly different form was used by Selfridges to promote its sales for a couple of years, though perhaps inevitably they dropped the campaign once the effects of the economic downturn kicked in. For Selfridges the works were purely text-based, with black-on-white text on a red ground. 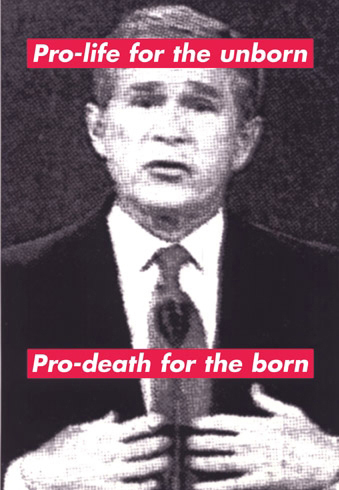 Though the format was slightly different to her usual image/text pieces, nontheless the slogans, the typeface – Kruger has use the same font, Futura Bold Italic, from the start – and the way they were presented were clearly identifiable as Kruger’s, though the campaign was a collaboration with the advertising agency Mother. Though in a way this campaign seemed like an odd collaboration for Kruger, it seemed perhaps like an even stranger choice for Selfridges in that it highlighted the emptiness of advertising slogans and the fact that aimless shopping is really never the answer to anything. Ultimately, though this could have been seen as selling out, I think Kruger managed to get away with it. 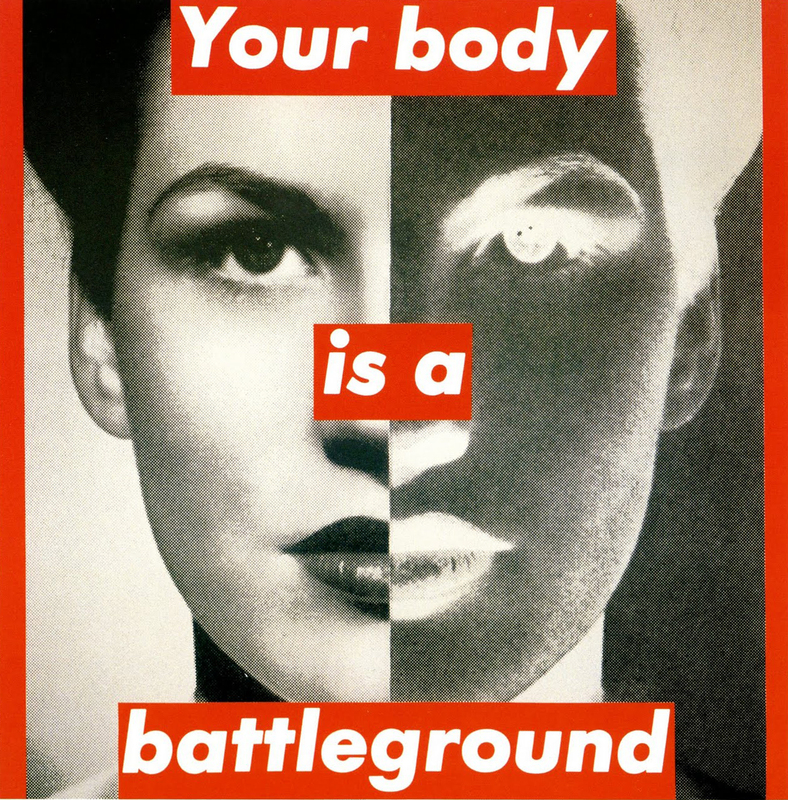 This entry was posted in Photography, Politics, Printmaking, Text and tagged advertising, art, Barbara Kruger, Buy me I'll change your life, feminism, graphic design, I shop therefore I am, It's a small world, Mother, photography, political art, Selfridges, We don't need another hero, Your body is a battleground by Ann Jones. Bookmark the permalink. awesome post! I have been researching her for a while :) thanks for the info. The question of selling out is really interesting one – didn’t Sam Taylor-Wood do something similar? As I expected (always thought of her as an media/ establishment figure), she did seem to sell out. But I think just by their negative nature, Kruger’s pieces work a kind of anti-shopping magic – I like to think people are easily discouraged from being credulous where advertising is concerned. And the image you’ve reproduced makes the shop look somewhat shoddy. Really interesting post. Thanks. I agree about the idea of an ‘anti-shopping magic’ – very nicely phrased – and I think that’s probably why they stopped using the campaign when the economic situation changed. A few artists have worked with Selfridges in less directly sales-related ways; Sam Taylor Wood’s piece was by far the largest scale but it felt very much like her work rather than advertising, I think. And they’ve had some interesting exhibitions in the basement, which doesn’t quite fit with expectations of a shop.